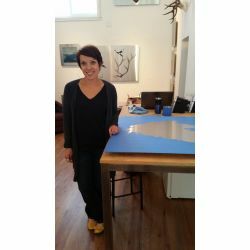 "I paint contemporary nature-based works in oil on exposed stainless steel"
Mai Wyn Schantz is a 1999 graduate of Rocky Mountain College of Art & Design in Denver, Colorado and has been exhibiting professionally for over ten years. Her work is included in many private and corporate collections including the Weidner Center for the Arts at the University of Wisconsin, Green Bay, the Aurora Arts Council in Colorado and Northwestern Mutual Life Insurance in Wisconsin. In 2006 she was included in her first museum exhibition Up North: Imaging Northwoods Culture and Mythology at the Museum of Wisconsin Art and in 2008, was featured in a solo exhibition at the Arvada Center for the Arts & Humanities in Colorado. She is represented by Trove Gallery in Park City, Utah. Back in Denver for almost ten years, Schantz firmly rooted herself in the Denver art community by opening Mai Wyn Fine Art, a combined studio-gallery space on Santa Fe Drive in 2013.